Over the last week or so, Twins Daily has handed out our 2018 minor league awards. Today we continue the series by looking at the top hitters in the Twins organization this season. There were a lot of strong performances, but at the end of the day, the vote was unanimous. Despite missing the entire 2017 season, Alex Kirilloff was our choice for 2018 Twins Minor League Hitter of the Year. Before we get to the Top Eight, we will take a look at others who received votes. While some of the top prospects finished near the top of this list, the Twins got quality hitting performances from many guys up and down the system. But when it came down to it, there was one Twins hitting prospect who stood out above the rest in 2018. 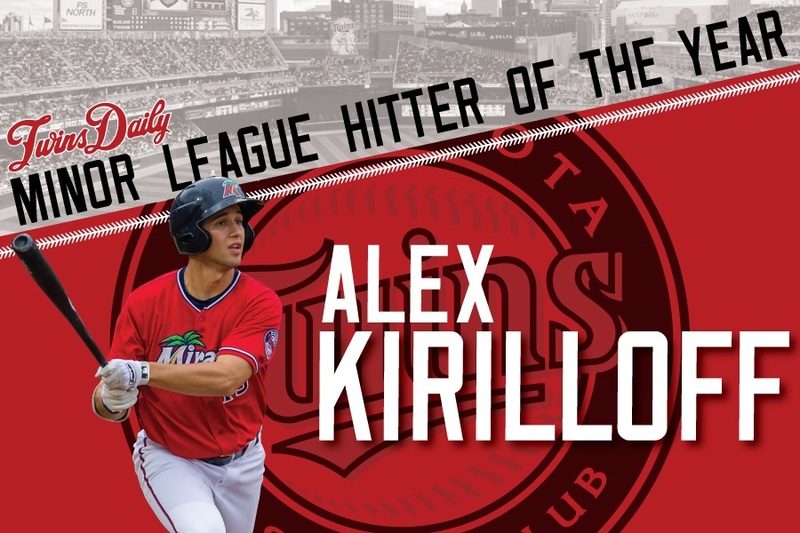 Royce Lewis and Brent Rooker had really terrific seasons, but Alex Kirilloff had one of the best minor league seasons in recent Twins minor league history. Six Twins Daily Minor League writers were asked to vote for the various awards. For the hitter of the year, we each voted for eight players. The player who was voted as #1 received eight points, #2 received seven points and so on with the #8 vote receiving one point. Results were tabulated and can be found below. Short profiles of our top eight are to follow, but first, some players worthy of honorable mention. These players also received votes. Ryan Jeffers - Elizabethton Twins/Cedar Rapids Kernels - 64 games, 83-241, .344/.444/.502 (.946), 17-2B, 7-HR, 48 R, 33 RBI. Jose Miranda - Cedar Rapids Kernels/Ft. Myers Miracle - 131 games, 133-503, .264/.319/.417 (.736), 27-2B, 1-3B, 16-HR, 61 R, 82 RBI. Willians Astudillo - Rochester Red Wings - 78 games, 79-286, .276/.314/.469 (.782), 17-2B, 1-3B, 12-HR, 30 R, 38 RBI. LaMonte Wade - Chattanooga Lookouts/Rochester Red Wings, 120 games, 109-424, .257/.360/.380 (.739), 11-2B, 4-3B, 11-HR, 54 R, 48 RBI. Michael Davis - Elizabethton Twins/Cedar Rapids Kernels, 45 games, 48-157, .306/.343/.567 (.910), 9-2B, 1-3B, 10-HR, 29 R, 32 RBI. 8. Luis Arraez – Ft. Myers Miracle/Chattanooga Lookouts – 108 games, 126-406, .310/.361/.397 (.758), 20-2B, 3-3B, 3-HR, 52 R, 36 RBI. Arraez hit .347 for Cedar Rapids in 2016 to win the Midwest League batting title as a 19 year old. Three games into his 2017 season in Ft. Myers, Arraez tore up his knee and needed surgery which cost him the remainder of the season. He came back to the Miracle in mid-April and had just two hits in his first 29 at-bats (.069). Over his next 53 games, he hit .357. He was the Twins Daily Hitter of the Month in June when he hit .449 with 13 extra base hits and an OPS over 1.100. He played 26 games that month and had multi-hit games in 16 of them including five three-hit games, two four-hit games and a five-hit game. On July 4th, he was promoted to Chattanooga where he hit .298 over the final 48 games. 7. Akil Baddoo – Cedar Rapids Kernels – 113 games, 106-437, .243/.351/.419 (.770), 22-2B, 11-3B, 11-HR, 83 R, 40 RBI. When looking at Baddoo’s stats, it is important to look past the batting average. Sure, that’s an area of improvement that he’ll want to make in his development. However, when he consider his on-base percentage and the extra-base hit power and you can understand why the organization is so excited about the talented 20-year-old. In fact, he didn’t turn 20 until mid-August. Baddoo does a nice job at the top of the order. Considering how many walks he takes, Baddoo is not a passive hitter. As you would guess from the extra-base hits, he’s got a strong, powerful swing. He’s got very good speed and stole 24 bases. He also profiles as a very solid center fielder whose arm strength has improved since the draft. 6. Jaylin Davis – Fort Myers Miracle/Chattanooga Lookouts – 120 games, 120-439, .273/.347/.412 (.759), 24-2B, 2-3B, 11-HR, 53 R, 53 RBI. The former 24th-round pick from Appalachian State put together a solid season in 2018. Since signing, he has shown good power, but he’s also had a lot of swing and miss in his game. While he still did in 2018, it is important to note that his strikeout rate dropped while his walk rate increased significantly. Davis spent the second half of 2017 in Ft. Myers and that is where he began the 2018 season. At about mid-season, Davis received his promotion to Chattanooga where he put up very similar numbers. Davis will look to continue his improvements in the Arizona Fall League. Grzelakowski was one of the better stories in the Twins minor league system in 2018. Signed late in 2017 as a non-drafted free agent from the United Shores Professional Baseball League after a career at Madonna University. He got a handful of at-bats in the GCL after signing last year. He came to spring training this year, and when the season started, he had skipped Elizabethton and Cedar Rapids and made the Ft. Myers roster. He caught, played first base, and played some left field while making a lot of starts at DH too. And it didn’t take long for him to hit near the top of the Miracle lineup. He hit well and was very consistent throughout the season. So, it may have started out as a fun story, but “Gelly” made himself a prospect to watch with his strong bat. Since the Twins made Zander Wiel their 12th-round draft pick in 2015 out of Vanderbilt, he has been consistent and moved up one level each year. 2018 was the first season in which he received a late-season promotion, playing 16 games at the end of the year in Rochester. Drafted as a first baseman, Wiel and Brent Rooker split time between first base and left field throughout 2018. Wiel takes generally professional at-bats. He has a lot of doubles power and can sometimes hit some long home runs. He had a walkoff homer in a game for the Red Wings. 3. Brent Rooker - Chattanooga Lookouts – 130 games, 128-503, .254/.333/.465 (.798), 32-2B, 4-3B, 22-HR, 72 R, 79 RBI. The Twins liked Brent Rooker enough that they drafted him twice. He was the team’s 38th-round pick in 2016 but chose to go back to Mississippi State. He won the SEC Triple Crown in 2017 and the Twins made him a supplemental first-round pick after the season. The Twins pushed him to Ft. Myers to end last year, and he spent his first full minor league season in Double-A Chattanooga. Things started out pretty slow for Rooker. Through his first 42 games, he hit just .233/.278/.374 (.653) with four home runs. Over his next 60 games, he hit .312/.389/.624 (1.013) with 20 doubles and 16 home runs. He struggled again late, but again, we can see what Rooker’s potential is. A lot of strikeouts (150!) and a lot of power and extra-base hits. 2. Royce Lewis - Cedar Rapids Kernels/Ft. Myers Miracle – 121 games, 141-483, .292/.352/.451 (.803), 29-2B, 3-3B, 14-HR, 83 R, 74 RBI. The top pick in the 2017 draft had a strong first full season in pro baseball. He began the season in Cedar Rapids, where he finished the 2017 season, and did well. In 75 games for the Kernels, he hit .315/.368/.485 (.853) with 23 doubles and nine home runs. Many of those extra-base hits came in his final 40 games with the Kernels. He made the Midwest League all-star team and a few weeks later, he was promoted to Ft. Myers. In his 46 games with the Miracle, he hit .255/.327/.399 (.726) with six doubles, three triples and five home runs. Lewis impressed at shortstop, and he led the organization with 28 stolen bases. In the Florida State League championship series, he hit three homers to help the Miracle to the championship. There is a lot of reason for excitement in Lewis’s future. Alex Kirilloff – Cedar Rapids Kernels/Ft. Myers Miracle – 130 games, 178-512, .348/.392/.578 (.970), 44-2B, 7-3B, 20-HR, 75 R, 101 RBI. I mean, it was probably the easiest choice of all of our 2018 Twins Minor League award votes. All six of our voters chose outfielder Alex Kirilloff as the 2018 Twins Minor League Hitter of the Year. Kirilloff’s 2018 season was as impressive as we have seen in the Twins system in a number or years. It almost makes one forget that Kirilloff missed the entire 2017 season after having Tommy John surgery last March. He was cleared for all baseball activities by about Thanksgiving last year, and he was a full-go in spring training. He began the season in the cold of Cedar Rapids. In his first three games, he went 1-for-12. And from that point forward, he was remarkably consistent. In 65 games in Cedar Rapids, he hit .333/.391/.607 (.999). Then in Ft. Myers, he played 65 games and hit .362/.393/.550 (.943). Following the All-Star Game, Kirilloff went directly to the Ft. Myers Miracle. In his second game, he had four hits and followed it up with a three-hit game. A few weeks later, Kirilloff represented the Twins on Team USA at the Futures Game. His manager was Torii Hunter. LaTroy Hawkins was the team’s pitching coach. Matthew Lecroy was on the coaching staff. Miracle hitting coach Steve Singleton was the Team USA hitting coach for the game. Singleton said recently that he and the other coaches knew the Kirilloff would have a great showing. When he returned to the Miracle lineup, he had multi-hit games in eight of his next nine games. He had hits in 27 of his next 28 games. The consistency that Kirilloff showed throughout the season can be illustrated by the below tweet showing where his line drives and fly balls went in 2018. Kirilloff uses the whole field as well as anyone. That trio played in the Florida State League championship series, and that trio helped the Miracle to their second Florida State League championship in the last five years. What a year 2018 was for Alex Kirilloff. And, as voters, we appreciate him making the voting quite easy this year! Feel free to discuss. What do you think? Do you agree with our rankings? How would your ballot look? Definitely an impressive season by Kiriloff. But by and large,not too many standout seasons from the hitters in the system. Interested in the reasonig why Jeffers wasn't in your top six. MLBTR did a similar thing that I saw yesterday--NOT A PROSPECT RANKING-just a list of the top 20 statistical seasons (pitchers and hitters) in the minor leagues this year. AK was 4th I think, and Lewis 16th. In a normal year, you would subtract those top two guys and Rooker is number 1 and I'm still liking this list. AK, if he keeps it up, will be pounding on the door next season. Got to be excited about that top 3.And what can you say about AK after a season beyond what anyone could have expected.If 2019 is anything like this year, expect to see him at Target Field next September. And you have to be so happy for Gelly, what a year.What was a shock, to me at least, was seeing Arraez at #8.Checked to see why and to be honest, can't understand that three of you didn't vote for him in their top 8?Also, a bit surprised to find LaMonte Wade as an honorable mention.Really had a disappointing year.I will be surprised if he is added to the 40-man in November. Thought the quotes from Zoll were a big plus to your report, Seth.Liked his comment about 'pushing' Rooker.That together with how slow he started the first month makes one wonder if he can make it to the Twins by next summer? Thanks for all the work this year guys. Jeffers is the missing man for me.I like the top two a lot, but as a person who dislikes strikeouts Rooker disappointed me.I know he is still up in the top list, but there are others I like more.LaMonte Wade was a disappointment this year for me just like rdehring stated. Could Jeffers only playing in 64 games have something to do with that? The easiest pick for the panel in any of the categories. I really think Kirilloff has star potential. And unlike so many Twins star prospects I think he will come up and take right off. Just think if Buxton, Sano and to a lesser degree Kepler has come close to their potential and in a couple of years you add Kirilloff and Royce Lewis to the mix with Rosario, Polanco and Tyler Austin. And others like Jeffers, Rooker and Luis Arraez waiting for their chance. It might still happen. And if it does, what a fun time it will be for Twins fans. Things got very challenging for me after the top 5. There's kind of a three-tier thing going on in my eyes. You've got the top three pretty clearly above the rest, then 4-5 in a tier of their own, but then after that you've probably got about 6-8 guys all pretty close. On Jeffers, was just tough for me to justify putting a short-season guy up there this time around. Rooker was a different animal last season because he went up to Fort Myers and hit for power in the FSL, which almost nobody does. What was a shock, to me at least, was seeing Arraez at #8.Checked to see why and to be honest, can't understand that three of you didn't vote for him in their top 8?Also, a bit surprised to find LaMonte Wade as an honorable mention.Really had a disappointing year.I will be surprised if he is added to the 40-man in November. Again, those were two of the several guys I started to consider all the way up at six, it was very close. The big difference to me on Arraez and Wade was what happened with their balls in play. Arraez had a .338 BABIP and Wade's was .287. Wade was much better at hitting home runs, drawing walks and even held an advantage in stolen bases. Thanks for the reply, Tom.Its helps to understand your thought process going thru this process.But a .338 BABIP for Arraez should be expected as that is at or lower than his actual batting average much of the year (taking out the first couple weeks at AA after the promotion).To be honest, I would expect his BABIP to be higher next year. That could be, and guys who barrel up the ball more often are always going to have a higher BABIP than those who don't, so it's not all luck/things don't always even out. The only thing is if Arraez's BABIP were to drop, he's going to be providing very little offensive value. He's incredibly reliant on his balls in play going for hits. I just think Wade put together good at bats on a more regular basis. His process was better and the overall results were very similar. Wade also crushed him in 2 outs, RISP situations (Wade .297/.409/.459 in 88 PAs, Arraez .258/.338/.258 in 74 PAs). I was thinking about this conundrum as I was reading the piece. You might think about a variation to the ranked voting idea: Have ten ranks for your eight choices. In your case, you would rank the top three #1, #2, and #3 (10, 9, and 8 points). Then leave #4 open to indicate a gap in your assessment, putting your next two in as #5 and #6 (6 and 5 points). Another gap at #7 leaves your "6A, 6B, and 6C" as #8, #9, and #10 (3, 2, and 1 point). It's probably not worth the confusion it might cause, but it would allow a voter to express that not all ranks are equally spaced. If you felt really strongly about the top candidate, you could even leave a double gap at #2 and #3 and rank your second-best candidate at #4. I didn't read the whole article yet, but when I looked at previous winners, I cringed. Please, please, please let Kiriloff, Lewis, Rooker, et al become as proficient as major leaguers as they were/are as minor leaguers. We have been living on hope for too long. I hope to see Chris Williams and Junior Severino in this list next year. Rooker was a different animal last season because he went up to Fort Myers and hit for power in the FSL, which almost nobody does. What makes Rooker not another Walker, Palka, Arcia, etc.? As always, great article, Seth. Appreciate all your research. Top minor league hitters article left me much more excited than top pitchers, especially after seeing Gonsalves' results in MLB. Once again, hope for the future while we take our Rolaids now. That's my reasoning... the lowest number of games played that I voted for on this list was 95, ,and that was Taylor Grzelakowski who played a bit of catcher. Obviously, playing his college ball in the SEC helped prepare him for such a jump, but it's still impressive to me what he was able to do at Double A in his first full season. Also, I get Walker, but is comparing a guy to Palka or Arcia really that big of a dis? I don't think so.